Karangasem remains best known for its mountainous landscape, isolated beaches, and small villages preserving age-old local traditions. Snorkeling trips off the coast provide a look at the area's rich marine life, while guided tours of old temples ensure a brief but rewarding glimpse into the region's past. 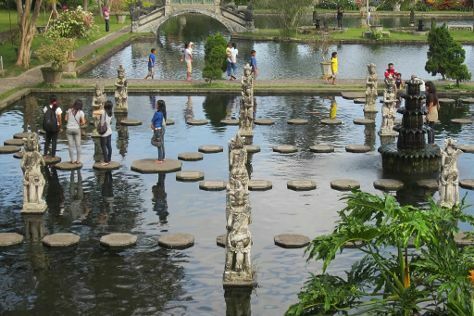 The main urban areas cater to modern tourists while maintaining their old-fashioned charm, with traditional markets, city temples, and shrines providing plenty of rewarding places to visit on a Karangasem holiday. Karangasem is in Bali. Arrange all the small, but important details of your Karangasem trip itinerary using our Indonesia trip planner . The primary places to stay in Karangasem lie next to the sea. Take the coastal road east from Manggis to find luxury resorts and spas, offering sea views and modern amenities at relatively high prices. The eastern peninsula provides something to suit all tastes and boasts a range of simple hotels and rental apartments.